National Urban Policies to the Rescue? A Unicef report examines whether all children living in cities fare better than their rural peers. Though urban residents on average enjoy better access to services and opportunities, a substantial part of the urban population is being left behind. The presumed urban advantage is not available to all. For example, the poorest urban children in 1 in 4 countries are more likely to die before their fifth birthday than the poorest children in rural areas. And the poorest urban children in 1 in 6 countries are less likely to complete primary school than their counterparts in rural areas. Poverty, previously predominantly a rural phenomenon, is becoming increasingly urban. As more and more children live in cities and towns, it is becoming increasingly critical to understand the prevalence of the urban paradox and the extent to which it is masked by the narrative of the urban advantage. To better understand this issue, UNICEF examined the best available international evidence for 10 selected indicators of child well-being. Much of the analysis focuses on comparing rural and urban populations and comparing the top and bottom wealth quintiles for these populations. The average country exhibits a clear urban advantage on all 10 indicators of child survival and well-being. The size of this aggregate urban advantage varies across indicators. Urban averages can mask large inequities within urban areas. Inequities also exist in rural areas, and there is no evidence that urban wealth disparities are consistently larger than those in rural areas. Urban wealth disparities diminish with economic development. Much of the urban advantage disappears if we control for wealth. In a number of countries, the poorest and most vulnerable urban children fare worse than their peers in rural areas. Urban wealth disparity gaps are larger in Africa than in other regions. Urban inequality can take different shapes – from only the wealthiest moving ahead to only the poorest being left behind. Maternal education, like household wealth, is an important correlate of child welfare in urban and rural areas alike. 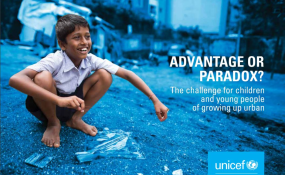 Turning the urban paradox experienced by millions of children and young people into an urban advantage is a key challenge for cities and towns across the world. Now is the time to step up efforts in this area. The cost of inaction is high: almost 90 per cent of the world’s children and adolescents live in Africa and Asia, which are urbanizing rapidly. Today, approximately 1 billion people are estimated to live in slums, the worst form of informal settlement, and hundreds of millions of them are children under 18. Based on current trends, those numbers are likely to triple by 2050. Scaling up urban programming for children and young people is now a global imperative in all regions.